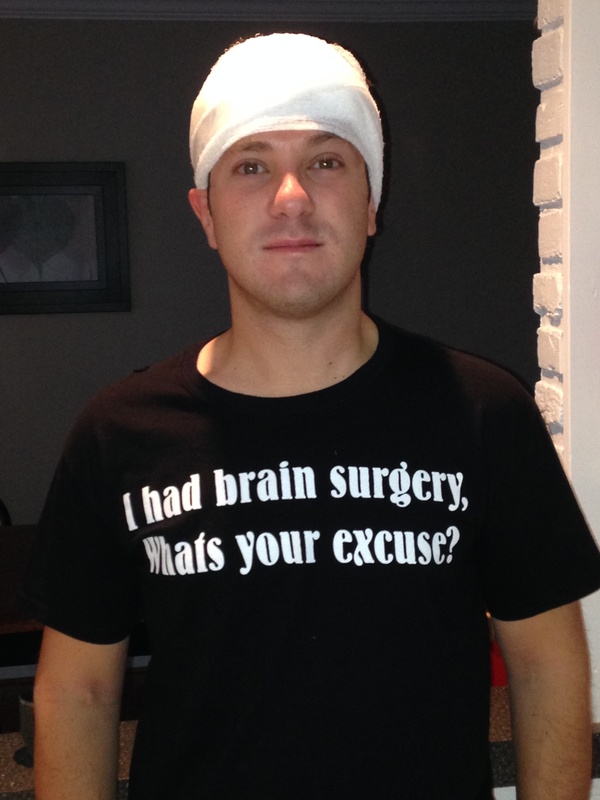 For my readers who have a brain tumor or had a brain tumor, you will agree – life is that much more difficult for us. And when you pile on preparing for the bar exam and the expectations to pass it, life becomes arduous. To sit for the Connecticut bar exam, all applicants must pay a filing fee of $750.00. The application consists of approximately 30 pages of questions and requirements such as listing every residence you held for more than thirty days, both temporary or permanent, since your eighteenth birthday or for the past ten years, whichever is shorter. Oh, and in chronological order. The application also requires an applicant’s employment history, again both temporary and permanent and in chronological order. You will also need affidavits, letters of reference, a certified driving history, a copy of your law school application, verification of your law degree and a Certificate from the law school Dean which states that you entered law school on such and such a date and earned your degree on such and such a date. And a contract to give up your firstborn child…not really, but might as well. The exam is administered over two days, each day being 6 hours long. Testing accommodations (special test-taking exceptions for applicants with qualified disabilities) are available, but any applicant who wishes to avail themselves of these must complete a further application and have his/her doctor complete paperwork and submit all supporting materials to prove the accommodations are necessary. Seriously?! My surgical reports which stated that I had a large tumor resected from my brain, along with having a device inserted allowing me to function on a day-to-day basis doesn’t constitute a “current substantial limitation to a major life activity”? Not to fret though, my doctors and I would just send in additional records, along with past and current images of my MRIs. In addition, we provided the results of the neuropsychogical tests accompanied with a letter providing an update on my diagnosis, changes since that test, current treatment (which would be the shunt and anti-seizure medicine) and rationale for providing me with extra time and a private testing room. We submitted everything imaginable and I was notified that my request had been granted. The bar exam application required the same documentation which meant that I had to resubmit all the same documents. If you’re an applicant with a disability applying for admission to the bar, the first step for you is to apply for accommodations. Applicants with a disability are entitled to apply for whatever accommodation that you “the applicant” deem necessary to provide you an equal opportunity to pass as the applicant next to you. The bar exam, at least in Connecticut, begins both days at 9:00 a.m. and ends at 4:00 with an hour for lunch. Ask most applicants and they will tell you they felt pressed for time. After my tumor was removed, I was not the same person and 6 hours was not going be nearly enough time to complete the exam. Completing certain tasks now took me a lot longer as the information did not process as quickly as it had previously; or, like my final exam, I’d read a problem and understand it in my head but then end up writing ten pages or garble. So, what was I to apply for? To start, I knew for sure that I would need extra time, that was a given. And in talking with the bar examiner, if my request for extra time was granted, I would start earlier than the other examinees and end later in the day, but with one one-hour break for lunch only. So I would need something to eat in the exam room. And to drink. So I requested both of these as well. Additionally, I requested a private testing room to avoid being distracted by the hundreds of other examiners in the room. After the tumor resection, my ability to maintain my focus had diminished and my thoughts turn to mush. In order to receive any accommodation, my doctors had to complete paperwork that explained how “what” I was applying for would assist me in passing the exam. You said it, it was a headache. Not more than a month after everything had been submitted, I received a piece of mail from the bar examining committee notifying me that my request had been reviewed and granted. My schedule was 8:30-1:00 and then 2:00-6:30. I was permitted a private testing room, the extra time and a “quiet snack” (whatever that is). A drink was permitted, but it MUST be put into a clear bottle so that the examiners can inspect it. So, how does one prepare for the bar exam, you ask? Well, before explaining the methods and strategies that some utilize, let me first tell you about the exam. In Connecticut, the first day now consists of six essays and two multi-state performance test questions. The times that I have taken it, it was 12 essays on various topics. 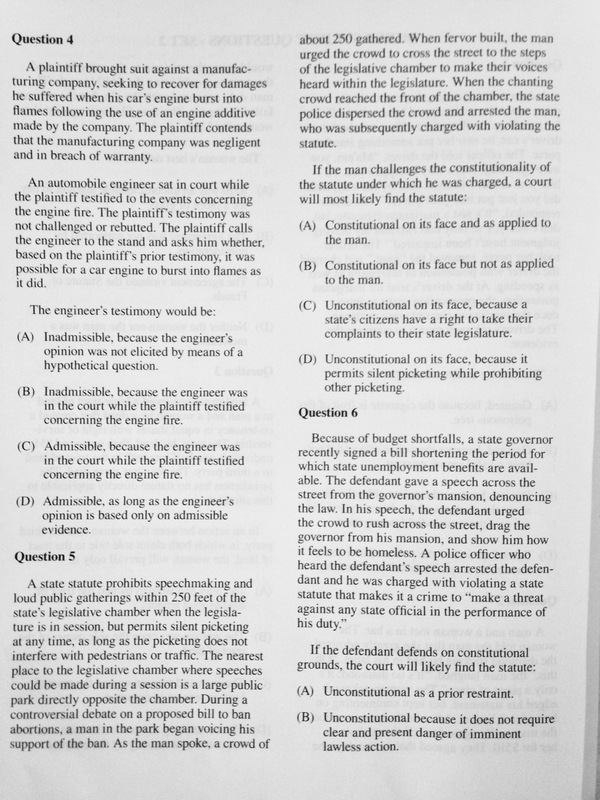 The bar examiners provide a listing of possible subjects from which they can draw questions. I think there were 18 total subjects. How nice. Day two consists of two-hundred multiple choice questions, all drawn from 6 subject matters – you have three hours to complete 100 questions in the morning and then three hours to complete 100 questions in the afternoon. These are not your run-of-the-mill multiple choice questions. Rather, each question is a complex problem which requires you to sort through the facts, analyze everything and select the “best” answer. Note that I wrote “best.” On the bar exam, there is no “right” answer; rather, they want you to choose the “best” answer and when there are four options to choose from, you can pretty much make a sound argument that any one of the four is the best answer. Now, for just $3,250.00, you can register for BarBri, a two-month bar review class designed to assist applicants in passing the exam. Upon registering, a nice present will be delivered to your address – two boxes filled with books. 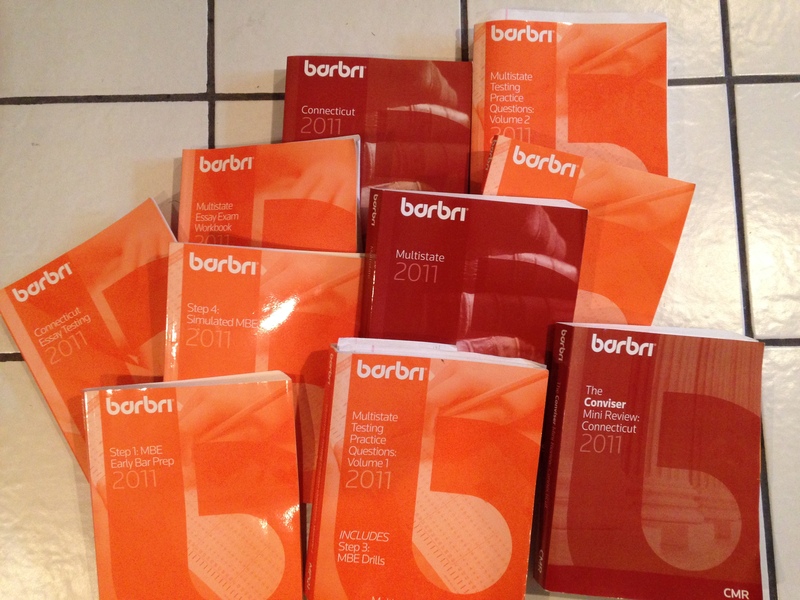 In the BarBri course, you attend classes in a lecture hall and fill in outlines in a book designed by course instructors. But there’s a twist – the lectures have all been pre-recorded and are shown on a video. If you have a question about any of the material, I’m sorry but you’ll have to email your question in and wait days for a response. While there is no requirement to taking the course, you put yourself a pretty high disadvantage if you don’t because almost everyone else takes it. And the books are chock-full of released questions. The video begins roughly around 9:30 every day and ends around 1:00-1:30. You then have about an hour to get home and eat lunch before you begin reviewing and analyzing the lecture outlines from that day. The advice given is to outline your outlines to absorb the material. Once that is complete, there are problem sets from the books pictured above to work through and complete. The problem sets can take hours. It’s a lot of work to get through 18 multiple choice questions as they are long and tedious and the only way to learn the legal concept is to answer the question and review the answers, specifically why the wrong answer is in fact wrong. The best way to sum up taking the bar exam is exhausting. A month into studying, you find yourself asking what have I learned the past month and how can I possibly remember all of this? Don’t worry – you’re told on day one of bar review class that you won’t remember everything so don’t bother trying. Wait, what?? Hazing. Survival of the fittest. I apologize in advance to the readers who are currently preparing for the exam next month – I have faith in you. As for me? I wasn’t nearly the fittest of the fit. Two years removed from having surgery, my brain was still not what it used to be. And I knew that it may never be. I had studied all that I possibly could; done as many practice questions and practice exams as humanly possible. I was mentally and physically exhausted. As the exam approached, I feared for my life. I feared that I would cause myself to have another seizure from the unnecessary stress of taking the exam, or yet, that the shunt would malfunction due to the stress I was putting on myself in trying to cram mounds of information into my brain. No stopping me now though – the moment had arrived – July 26-27, 2011. With a few more grades that raised my eyebrows, I shrugged it all off and went full steam ahead to the finish line – graduation day (sort of). While I would walk with my friends at graduation, I had to make up the one semester that I missed to recover (It’s still pretty remarkable to me that it was “only” one semester). The old adage is that 1L they scare you to death (hmm, maybe this all makes sense now? ), 2L they work you to death and 3L they bore you to death. As the end of the third-year neared, all of my friends were in full-blown frenzy with the wretched bar exam quickly approaching. For me, it was one of the happier times of my life. It was a bittersweet day. Law school represented, and still represents, the most tumultuous period of my life. Those three years brought out the best and worst of me, but graduation day meant it was time to say goodbye to so many good friends and the state that I had called home for three years. I was on the verge of the sweetest victory I could have scripted – earning my juris doctor degree. If you were to ask pretty much anyone on July 2, 2008 if I would ever finish my degree, you would find that the majority would say “no”. But not me. 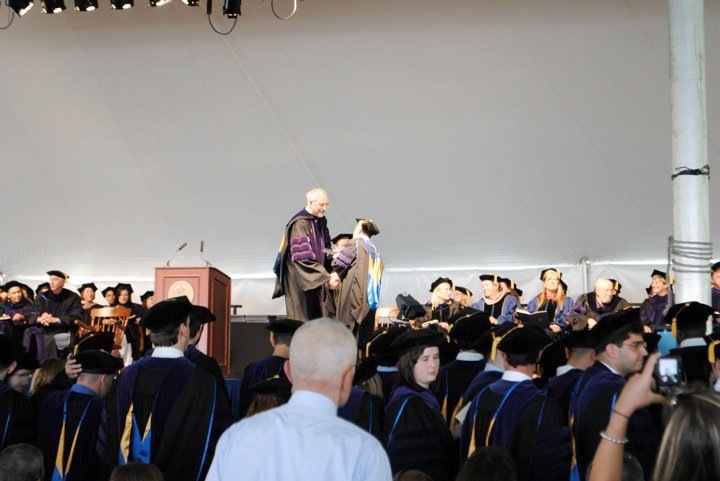 All that stood in the way of me and that moment was one semester at Quinnipiac University School of Law. Why didn’t I continue at Roger Williams, you ask? Simply put, I realized that all of my peers that I had entered this chapter of my life with would be leaving after we walk across the stage and would be returning to their respective homes to begin their careers. Back to Massachusetts…back to Arizona…back to New York….back to Connecticut. Everyone was scattering and what was I to do there without my support group? I needed someone to be there for me, who knew my struggles in the classroom as well as my medical history to guide me through the last semester and so I opted to complete my final semester as a visiting student at Quinnipiac University. Now talk about support. 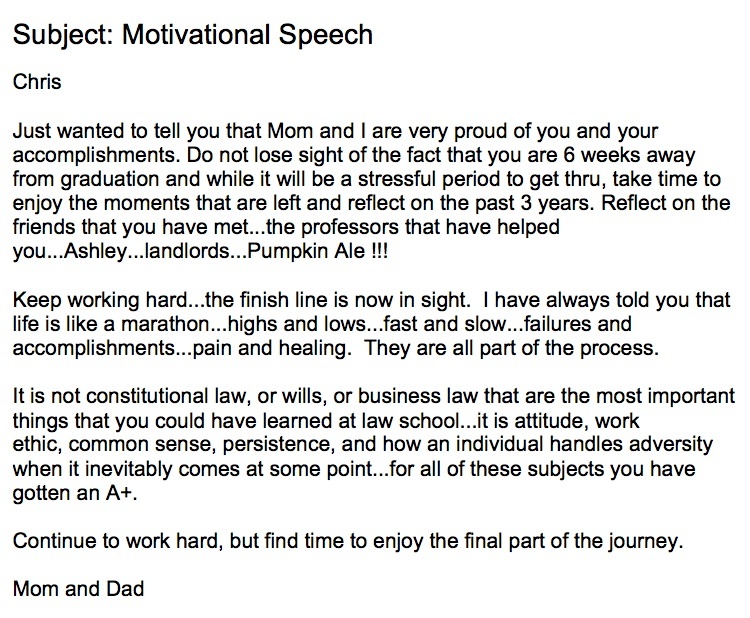 This email is just a sample of the support that I provided by my family and friends throughout law school and during my illness. This was all the motivation that I would need to carry me through to the end. Once again, my parents were right there to pick me up and provide me the encouragement that I needed to dig deep within and find the will to get through the semester. I know I sound like a broken record, but without the support of my family, especially my parents, none of this would be possible and I would be unable to write this blog. As I typed the final “ . ” of my last final exam, I was overcome with joy. Sweet victory, I had accomplished the unimaginable. After all of the trauma my brain had overcome and the adversity I faced, I was finished. There were no words to express the sense of pride and accomplishment that I felt at that moment. What came next was trying to figure how to pass the bar exam – but how? There was no holding me back now though. I had worked so hard and had come so far. But being human, I think and wonder what I would have done with my life had I been diagnosed prior to enrolling in law school. But what’s in the past is in the past. I dismissed the fact that exams were now even more difficult for me than they had been previously. After forking over nearly a thousand dollars just take the bar exam, in addition to thousands to take a prep course, I was on my way once again. Or wasn’t I? I’ll save the topic of the bar exam for another day. So you didn’t get that job that you applied for? Or maybe you got a C as opposed to B in that class? Did you stay at the office late today, and yet still have piles of work to get through? Your car’s broken down…again. Sure these are all legitimate problems and life sure is full of them. What matters is how we deal with them and how we come out on the other side. Coming home in May, not even a year removed from receiving my diagnosis, I had a new outlook on life. My first semester back at law school was eye opening. Don’t get me wrong, I wanted to do well and maintain my class ranking, but I also refused to push myself too hard and kill myself over schoolwork. During my hospital stay, my medical team constantly reminded me that I would never be measured by my classroom or courtroom experience. No matter what happened after my hospital stay, I would always be defined by my determination and perseverance in overcoming obstacle after obstacle. During the ensuing months following my surgeries, I was a spectator to life. I viewed everyday occurrences with an open mind. No longer did I stress about getting an A. Did I want to? Of course (I am Type A, after all); but I knew that if I attended class throughout the semester, analyzed the readings, studied and completed practice exams, I had done all that I could do and whatever grade I earned at the end was okay with me. From day one of the first year, the focus is finding a job and earning exorbitant amounts of money. Now, let me clear this up for you right now – that’s a fallacy. Unless you finish in the top 25% of the class, you bounce around from job to job or maybe even through temp agencies and in real life, never make those millions you imagined were possible. After my performance first year, I didn’t even concern myself with making it into the top quarter of the class, but even if I did, I’d be crazy to push myself that hard. Life is far too short and fragile to let one insignificant thing in the grand scheme of things consume you. I watched countless friends obsessively agonize over outlining and analyzing cases and statutes to earn the grade they were striving for. The same holds true in practice. I am simply amazed by how many of my peers stress over getting the hours in or getting their motion heard on the court calendar. I just watch in amazement and think to myself “what if?” When I witness such events, it takes every ounce of energy out of me to not say something, but I understand it – we all work hard and want good results for efforts. If you work for a law firm, you have billing requirements that you must meet by years end, and after all, we need to keep our jobs to put food on the table. But at what cost? It makes me wonder why as a society, we have created all of these human manufactured stressors. I don’t mean to diminish your worries. They are real and legitimate. At the same time, I urge you to never stop focusing on the big picture and seeing what is truly important. It seems to me that we too often take for granted what we have and lose sight of what really matters because we are too busy focused on nonsense. Ever since I’ve recovered, I’ve felt like my life is moving in fast motion. I have since learned to make sure I then take a deep breath and calmly approach the situation when I find myself getting stressed or frustrated. My persona has changed immensely and I know this is a blessing in disguise. Gone are the days where I rushed around, driving myself nuts to get everything accomplished by some arbitrary deadline. I got my second chance, and I refuse to waste it by missing out on life’s joys.